I received this copy as a free ebook ARC from NetGalley. For the first couple of chapters, I really wasn't sure about this book. It felt very stilted and I wondered what on earth was going on...but as soon as I got into the flow of the story, I was hooked. I didn't find Voss a particularly likeable character at first and yet he slowly grew on me just as he does on our heroine. At first I wanted to beat him off with a broom, but by the end I was ready to swoon in his arms. Once things got underway, the story was better paced - action blended well with quieter moments. I loved the Regency setting, the turmoil adding to the excitement of the story. Her sense of time and place was not as much a feature as it is in Chelsea Quinn Yarbro's writing, but the little there was helped cement the story in a viable world. The rules for the vampires are interesting and different than anything I've read before which was a refreshing change in itself. I liked Gleason's writing style and will be sure to check out the further titles in this series as they come out and some of her other work. 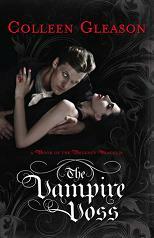 Recommended for vampire fans - especially those who enjoy a dash of history with their fang.